Tension fabric frames provide the flexibility to regularly update graphics for your latest exhibition stand or retail display. We have 20 years of experience in stretch fabric manufacture and print management. Tension Fabric Frames create graphic displays in an almost limitless range of sizes, that are incredibly easy to transport, install and replace. This is our most versatile graphic solution for wall-mounted displays. Robust enough to construct large graphic spans and at only 32mm profile depth is slim and elegant. High impact, double-sided display tension fabric solution used to make walls and structures it is also capable of freestanding or being ceiling-hung. Vertical and horizontal curves can be used to create dynamic walls, special features, archways, PODs and many other unique design solutions. Curved tension fabric profile can be both single or double sided. Creates seamless graphics corners both internally and externally. Fabric graphics run right up to corners without the need for a post. With 3D profile, you can create room sets, break-out areas, suspended cubes and a wide variety of other display solutions. Our slimmest tension fabric profile, measuring only 17mm deep. Micro tension fabric profile is ideal for wall-mounting where minimal frame visibility is desirable, and footprint is kept to the absolute minimum. Using our TFS system, you can create Tension Fabric Exhibition Stands that engage visitors. Our system also allows you to create unique tension fabric structures. You’re not stuck to an exhibition stand surrounded by three walls, you can create everything from curved structures to ceiling-hung cubes. Exhibition booths tend to follow a similar format, but with our tension fabric system, you can unleash your creativity. Retailers and exhibitors can hugely benefit from adding tension fabric system lightboxes to their displays. Research has shown that illuminated graphics catches the eye in crowded exhibition halls and retail locations. TFS Lightboxes are created in the same way as our tension fabric frames, albeit with the addition of an LED illuminated back panel. However, what makes our tension fabric system lightboxes some of the highest quality on the market, is that our team of lighting experts create custom illumination for your needs - whether that’s a bespoke colour temperature for a certain graphic or environment, or a certain depth of lightbox that needs output controlled to prevent ‘hot spots’ of light. Many of our customers are surprised by the amount of options available when creating tension fabric displays, especially when it comes to print. We take pride in having in-depth knowledge about the entire process, which means you get a better product as a result. 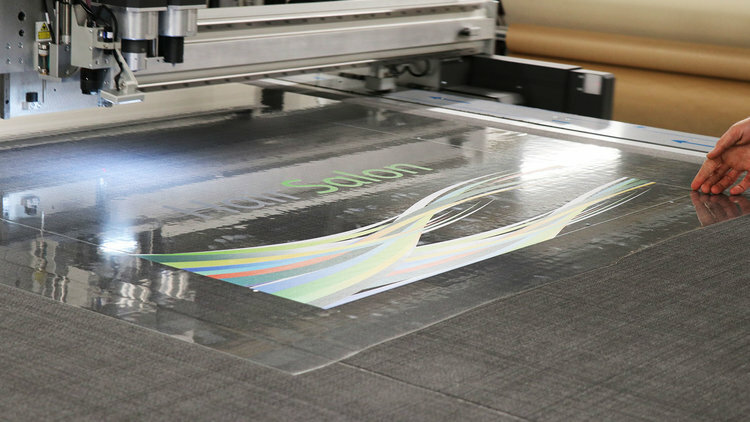 Each tension fabric graphic goes through a specific printing process suited for its application. Take exhibition stands for example. We’re well aware that when you’re under pressure to leave an exhibition hall, it’s likely a fabric is going to be pulled out of the frame and thrown into a box. Although we’d like to think that’s not the case, we recommend that our exhibition clients use dye-sublimated tension fabric graphics. This is because the ink is impregnated into the weave of the fabric itself, making for a much more resilient graphic. In comparison, there are different treatments available for illuminated tension fabric systems. These are often UV-coated to create a brighter effect when the lights are turned on, preventing any issues of colours looking washed out. Your designs are printed onto tension fabric material using a process called dye sublimation, which means the colours within your design are embedded into the actual fibre of fabric. This results in a display that can’t be scratched or rubbed off, and will stand up to the pressure of those quick exhibition tear-downs or crowded retail spaces. Fabric graphics are the perfect choice for displays that are likely to change, as their lightweight nature means they’re easy to store and transport - even for the largest of displays. As with many services, depending on the supplier you go to for tension fabric graphics, quality can fluctuate. Our 20+ years of experience means we have great relationships with top quality printers of graphics for tension fabric frames, and by offering our clients dedicated print management, we ensure consistency across every graphic while making the process of updating displays more streamlined.